A traditional country bed and breakfast home, known for its friendliness and hospitality. A guest from California wrote "the warmth and love in this home are infectious. It's restful for the soul as well as the body. It's wonderful to be so well cared for, so well fed!" Whether covered with a blanket of snow, spring blossoms or the many colors of fall, you will find the surrounding 165 acres of rolling hills and meadows a haven of relaxation and beauty. 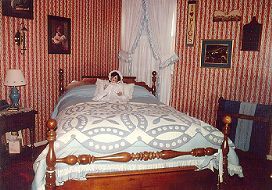 Our guest rooms are adorned with pretty country florals and prints, warm cozy quilts, family antiques and dolls. The larger guest bedrooms have television and air conditioning. Near West Point and Stewart International Airport and just 60 miles North of New York City. A minimum of 24 hours advance notice required for reservations. No smoking, pets or credit cards. This and other New Windsor Bed and Breakfast Inns can be found here in The Register.